Amongst abiotic stresses, drought stress is one of the main sources of crop loss around the globe. One protection strategy is the development of chemicals that help crops cope with water deficiency. Using a natural plant hormone as their starting point, scientists identified several novel analogues that are highly effective against drought stress. As they report in the European Journal of Organic Chemistry, they also gained new insights into the structure-activity relationship of the hormone. The plant hormone they used is called abscisic acid (ABA) and plays a key role in physiological processes such as seed maturation and seed dormancy. It has been commercialized for uses such as enhancing color development in red table grapes. In addition, it is known for its ability to promote the adaption of plants to environmental stresses such as drought or salinity stress. ABA consists of two distinct structural parts: a cyclohexenone headgroup (6-membered carbon ring with a double bond and an oxygen atom) and a terpenoid side chain (carbon chain containing two double bonds), both equipped with specific structural motifs. Inspired by structural features from earlier agrochemical projects and from in vivo experiments showing promising efficacy against drought stress, the team around Jens Frackenpohl at Bayer AG (Frankfurt, Germany) carried out molecular modeling studies looking for novel head group variations that might dock well into the binding pocket of a physiological ABA receptor protein. The researchers developed flexible synthetic approaches based on cross-coupling reactions (Stille or Sonogashira coupling). These reactions are key steps for joining the two building blocks together by connecting two carbon atoms. Their novel route enabled the researchers at Bayer to synthesize several series of ABA analogues for their biological and biochemical tests. As one major achievement they identified a novel headgroup bearing a cyano cyclopropyl moiety (a cyano group consists of a carbon and nitrogen atoms joined by a triple bond, a cyclopropyl group is a three-membered carbon ring) that proved to be a suitable replacement of ABA's cyclohexenone unit. They connected this novel headgroup to different side chains and carried out in vitro binding studies with the ABA receptor. In addition, the compounds were sprayed onto the leaves of crop plants under drought stress conditions. In total, the team identified several highly potent analogues of ABA with improved in vivo efficacy against drought stress in canola and wheat. In a further study, the scientists systematically explored a broad variety of novel side chain modifications to gain new insights into structure–activity relationships of the hormone. 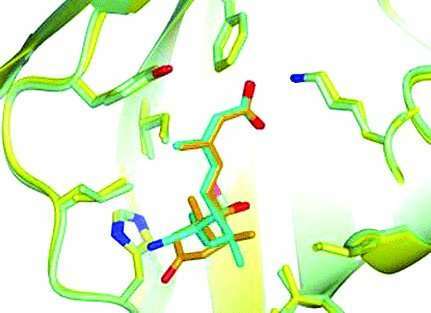 Results from in vitro measurements and crystal structure analyses confirmed a cavity of limited size in the ABA-receptor, which accepts only small substituents. Based on these results, they identified various additional new analogues of ABA with improved in vivo efficacy against drought stress in canola and wheat. They also observered promising effects in corn and barley.